“When I opened the door to my unit, I found a large suitcase,” Rhodes recounts. 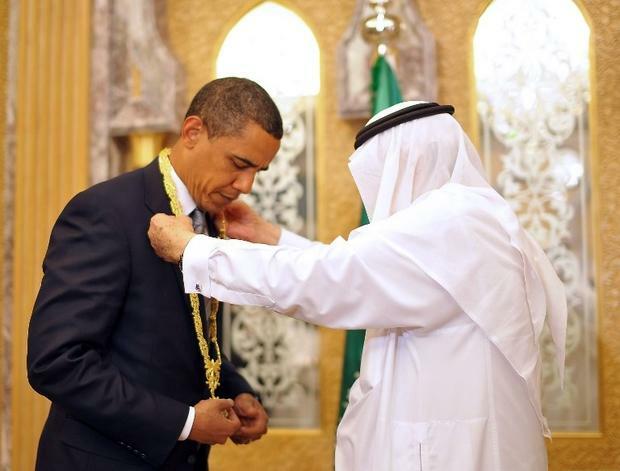 The trip to Saudi Arabia was the beginning of Obama’s first tour of the Middle East as president, and preceded his famous Cairo speech which he intended as a message to the Muslim world. Rhodes says at first he thought the bagged treasure was a bribe, to influence him as he wrote Obama’s speech. However, he soon learned he was not the only member of the delegation to be lavished with such expense. The State Department’s register notes the Saudis gave Rhodes “one pair of silver cufflinks, one male watch, one female watch, one silver pen, and one diamond jewellery set including earrings, a ring, and a bracelet, presented in a green leather case". It justifies the acceptance of such gifts by saying “non-acceptance would cause embarrassment to [the] donor and US government”. While the value of the hoard given to Rhodes is estimated by the State Department to be $5,405, the contents of the green leather cases given to other officials were far more precious. The gifts given to aide Marvin Nicholson were valued at $18,580, meanwhile Peter Rundlet, deputy assistant to the president and deputy staff secretary to Obama, was given $12,560 worth of jewellery.